Hmm... Would this knowledge enable us to declare humanism a religion? After all, A. humanism is familiar – the majority of humans ascribe to humanist values; they are “instantly comprehensible.” B. reinterpreting humanism as a religion is an exciting challenge just waiting to be acceptable, being new, but not too new. It's bold and assertive and has a familiar social chutzpah, like the Declaration of Independence. Wouldn't it fill a need for a secular religion for all the “nones” in this world? Secular humanists oppose any hint of fellowship with the superstitions of religion, yet most members of those religions share their own versions of humanism. There is also a legal case for making such a claim: In the interest of equal rights under the First Amendment against the demands of all fundamentalism, we might consider the historical tradition of secular humanism as likewise, a religion. What we would require is a broad definition of what “religion” means. Dictionary definition of “religion”: A. Belief in and reverence for a supernatural power or powers regarded as creator or governor of the universe. B. A personal or institutionalized system grounded in such belief. C. A cause or activity pursued with zeal or conscientious devotion. 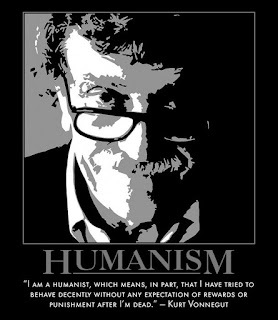 Doesn't ”religion” definition 'C' describe humanism? “The Affirmations of Humanism: A Statement of Principles,“ by The Council for Secular Humanism, or “The Humanist Manifesto” of American Humanists, fit that definition. We're so accustomed to religions defined as beliefs in a God or gods, as described in definitions 'A' and 'B' that we forget that Unitarianism, Scientology, and Buddhism have no God nor gods in them, though they are referred to as “religions.” Neither do all religions have churches, mosques, temples, etc. Some have fellowships and meeting-houses. Secular humanists have celebrants instead of clergy. Would “the Nones” be willing to sign on to humanism as a secular religion? The majority of humans already ascribe to humanistic values. (To quote Annie Laurie Gaylor of FFRF, “Most Americans live their lives like atheists.”) Aren't those who are out protesting, with marches, rallies, blocking entrances to traffic/streets, and shouting down the promoters of hatred and bigotry, essentially humanists?